Almond milk is a delicious drink that is made by soaking almonds in water then grinding and straining them. It is mainly used by those people who don’t like dairy milk or are allergic to it. Almond milk has been around for several centuries and in fact was in wide use during the middle ages by people who preferred it to animal milk. Now there are several different variants and flavors of almond milk and it is widely available. Yet much is not known about almond milk and its nutritional benefits, so we will try and explain it below. Almond milk has plenty of vitamins A, D and B complex and thus helps you get the right amount of these nutrients in a day. When you consume one glass of almond milk, you get around 200 units of Vitamin D and 500 units of Vitamin A and these make up around 20% of how much of these vitamins you should get every day. Almond milk also has three micrograms of B-12 which actually makes up 100 % of how much of this vitamin you need daily. All these vitamins have different uses for your body. For instance Vitamin E has a number of antioxidants that keep your skin healthy and glowing. Vitamin A is helpful for your eyes as it helps your eyes adjust to any vast changes in light. This milk also has calcium and Vitamin D and thus also keeps your teeth and bones in good health. Vitamin D also protects the body against Alzheimer’s disease, improves immunity and cell function and also helps lessen the chances of osteoporosis in females. It also helps keeps your muscles strong and healthy as it contains Vitamin B-12, specially iron and riboflavin that regulates the muscles. Iron in fact helps your muscles absorb and then use the proteins in your body to heal, strengthen and grow muscles. Almond milk also has several minerals that are important for our body like zinc, potassium and phosphorous. Often almond milk is fortified using calcium so that it can be packaged well and this calcium is useful to maintain our bone health. If you consume three glasses of almond milk, you get around one-third of your required daily consumption of calcium: 1,200 milligrams per day for women and 1,000 milligrams per day for men. Almond milk does have fat content but this is the healthy kind of fat that is actually good for your body. When you drink 8 ounces of sweetened flavored almond milk, you will be ingesting 60 calories but around 25 of these are healthy fatty acids. If the almond milk is unsweetened, then you will be ingesting 40 calories and around 30 of these will be the healthy kind. 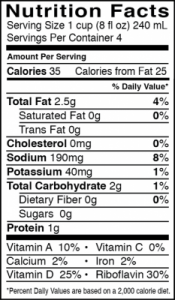 This healthy fat has no cholesterol and is not trans-fat or saturated. This almond milk has healthy fat and is low in sodium and thus keeps your heart in good shape. When you eat or drink food that has less cholesterol and low sodium, your blood pressure will be maintained at the normal rate and thus your heart will remain healthy. This milk also keeps the heart rate functioning well as it contains potassium that is known to regulate blood pressure. Almond milk has a good amount of proteins and many vegans and vegetarians will swear by this milk to get their daily intake of proteins. If you consume 8 ounces of this milk, you get around 2 grams of protein. Cow’s milk gives you 8 grams of protein in the same quantity but rice milk will give you much less. Therefore almond milk is a good substitute for atleast rice milk in terms of proteins. You can always add protein powder to this milk to supplement the amount of protein in it. 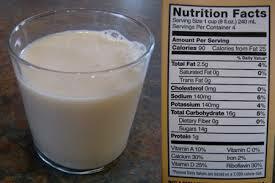 Almond milk that is made at home has no sugar but store bought almond milk will have some sugar added in it. However, this sugar is also glycemic and thus is easily absorbed and broken down in the body. This sugar does not get concentrated in one part and is used mainly for energy. Almond milk is a good option for diabetic patients as it only has 8 carbohydrates and does not increase the blood sugar level in the body. When almond milk is made, the skins of the almonds are not removed and thus you get the full benefits of the flavonoids in the almond skins. These flavonoids are good for the heart and prevent any cardiovascular diseases. This milk also has a number of antioxidants in it that helps prevent you from several diseases including cancer. You can make your almond milk at home to get all the benefits and to use as a substitute for dairy milk. Here’s what all you will need and how you can make it. Ingredients: 1 cup of organic sprouted almonds, 4 cups of filtered water, stevia, dates, honey and vanilla. Soak the organic sprouted almonds in water for atleast 12 hours and also add half a teaspoon of sea salt to the water before soaking the almonds. Soaking the almonds breaks down the enzyme inhibitors and phytic acid and helps the useful enzymes to grow in a beneficial manner. Then rinse the almonds and add them to four cups of water and put the mixture in a blender. Take out this mixture once it becomes creamy and smooth and then strain it using a kitchen towel. Then you must add honey or soaked dates to the mixture and put it back in the blender. Keep this strained mixture in a glass in your fridge and this can last atleast a week. Previous articleDoes Sperm Die When It Hits the Air?